Injuries From Epidurals for Chronic Pain Management in Washington D.C. Authorities on pain epidurals serving Washington, D.C.
A person who is in chronic, debilitating pain has only one real wish: to make the pain stop, by almost any means necessary. For many victims, steroid injections are a key component to fulfilling that wish. Unfortunately, the same epidurals that are supposed to ease your pain can give rise to a host of other illnesses or conditions that are just as serious as the original problem, if not more so. Paulson & Nace, PLLC, has genuine empathy for patients who are in chronic pain and understands that certain medications come with risks. But when a healthcare provider is negligent in the dosing or administering of steroid injections, we fight for the compensation you need to truly get well. For the last four decades, we have served the needs of medical malpractice victims throughout Washington, D.C. by being their advocates in trials and in settlement negotiations. Just as an epidural can be used to ease the pains of labor, so it can be used to ease chronic lower back pain, sciatica, spinal stenosis, pain from degenerative disc disease and herniated discs as well as neck and arm pain. ESIs are injected directly into the epidural space in your spine – a space that covers the dural sac, a blood vessel-filled area which keeps your spinal column protected. Together with a local anesthetic, and often with therapy, an ESI can help lessen the inflammation around the nerves and help reduce swelling and pain. Transforaminal epidurals are slightly different in that they are injected right at the opening of the nerve root as opposed to in the general epidural space. They are usually considered a last resort for patients who have undergone surgery to correct a problem to no avail. Like standard ESIs, transforaminal epidurals are temporary, though some patients have experienced permanent relief. In cases like these, your health is at greater risk than it was before the injection. In the most tragic of circumstances, a dosage error or a misplaced needle could lead to wrongful death. At Paulson & Nace, we understand the risks of ESIs, as well as our clients’ reasons for taking them. That is why we hold negligent doctors in Washington, D.C. accountable when their error leaves you in more pain and in worse health than you started. Our dedicated medical malpractice attorneys have secured millions of dollars in compensation for victims and their families who suffered needlessly at the hands of an incompetent or negligent medical professional. You do not have to handle this alone; we stick with our clients and their cases until the very end, and we never stop fighting to protect you and your family. 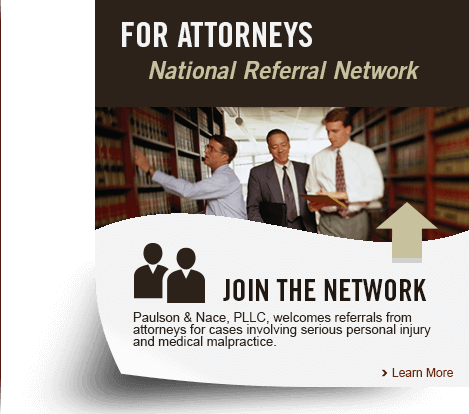 At Paulson & Nace, PLLC, we know that you are in pain, and that your pain may have been exacerbated by an act of medical negligence. We hold hospitals, rehabilitation centers and healthcare professionals in Washington, D.C. responsible for their errors. To schedule a no-obligation consultation with our skilled trial attorneys, please call 202-930-0292 or fill out our contact form.